We’re not inherently jaded about politics. You can’t have your idealism torn down if nothing was built in the first place. The 2008 election of Barack Obama promoted that idealism and gave people hope (the giant posters emblazoned with the word “Hope” may have had something to do with it). But we were all deceived when reality came crashing in and The Ides of March lays the blame not on our political system or even our politicians but on us. And when we realize that we can’t do anything larger than ourselves, we begin to think only of ourselves. 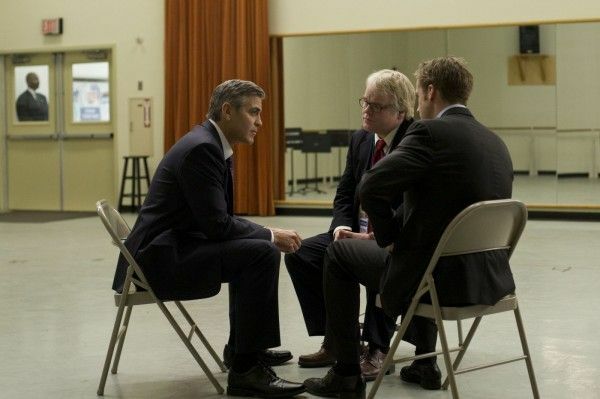 Director George Clooney (who also co-wrote the screenplay and co-stars in the film) avoids being preachy or heavy-handed, but his light-touch fails to leave a lasting impact. 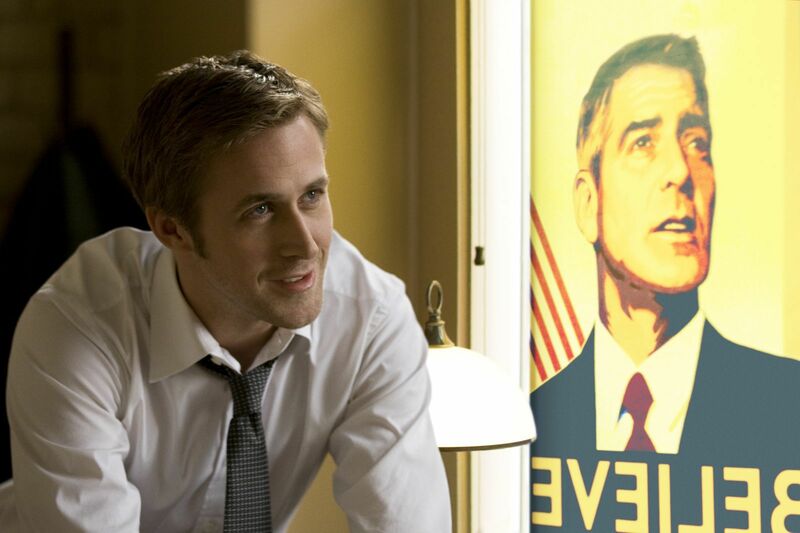 Press secretary Steven Myers (Ryan Gosling) is a true believer in his Presidential candidate Mike Morris (Clooney). Steven has worked on numerous campaigns, he’s well-liked by the press corps, and he’s damn good at his job. Even Tom Duffy (Paul Giamatti), the campaign director of Morris’ opponent, wants to steal him away. Working alongside veteran campaign director Paul Zara (Philip Seymour Hoffman), Steven is confident they’ll get Morris elected and change the country for the better. But when Steven betrays his own ideals, it starts a chain reaction which unravels his faith and makes him choke on the delicious Mike Morris Kool-Aid. Drawing Morris’ campaign so close to Obama’s is a double-edged sword. On the one hand, Obama is the perfect representation of how a country can project their hopes and dreams onto a handsome, well-spoken, and intellectual individual. But using the imagery of Obama’s campaign, from a riff on the famous Shepard Fairey poster to using the Gotham font of the campaign’s banners, makes the film feel dated and confined to a criticism of an individual rather than human condition. Additionally, the Morris/Obama comparison becomes further complicated by the scandalous revelation about Morris which doesn’t come close to coinciding with any rumor associated with Obama. But the idea of losing your belief in a political figure perfectly captures the zeitgeist. At one point, campaign worker Ben (Max Minghella) notes that in the general election, the inexperienced candidate almost always beats out his veteran opponent. The implication is that the American public prefers the devil they don’t know because maybe, just maybe, he won’t be a devil. It’s the inevitable result of identity politics and American reverence of “The Individual”: One man can save the country because that’s how heroic narratives are supposed to work. Hardly a profound realization, but it’s a smart way for Clooney to make his comment without coming off as Redford-esque (i.e. preachy and pedantic). 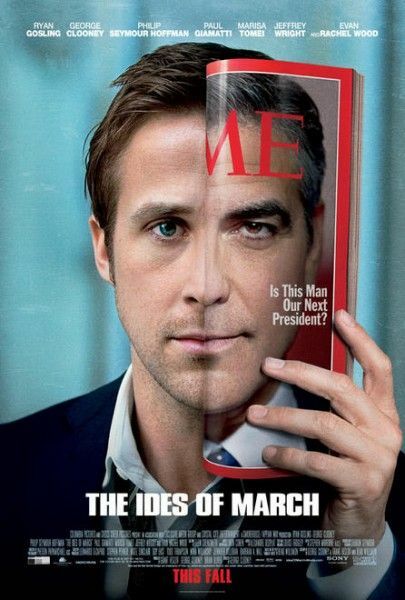 The Ides of March manages the difficult balancing act of exploring the current state of our politics and seeing how it relates to the American pscyhe. When characters talk about the campaign, they talk about poll numbers instead of policy. At one point, Steven tries to pitch Morris on giving kids a free ride to college in exchange for mandatory two-year service. “Older voters will like it because it doesn’t affect them,” Steven explains, “and those who would be against it won’t be old enough to vote.” It’s not the policy that gets Steven excited, it’s the political victory it could deliver. But with characters who are supposed to be political sharks, as an audience we must delude ourselves that they would make such obvious mistakes. Steven takes a meeting he shouldn’t. Paul believes that he can get senator Thompson (Jeffrey Wright) to deliver his delegates and essentially the White House because if Morris can win the Democratic Primary, he can beat the weak GOP candidate. Morris thinks he’s a man of integrity and dignity and doesn’t want to make a backroom deal with Thompson in order to win Ohio. Even Clooney gets in on the self-deception as he shows his bias towards journalists. The only character who seems to truly understand politics and getting at the truth is cynical New York Times reporter Ida Horowicz (Marisa Tomei). It’s an understandable bias when you consider that Clooney’s father is a journalist and Clooney made a loving tribute to Edward R. Murrow with Good Night and Good Luck. Despite the clever crafting of his central theme, Clooney never quite lands the knockout punch. Gosling, Hoffman, and Giamatti all remind us once again why they’re some of the best actors working today, and even Evan Rachel Wood, who usually turns me off a movie, makes her role as an intern on Morris’ campaign more than a plot point. The cinematography is sharp, the pacing is lively, and while the dialogue occasionally gets a little Sorkin-esque, it’s a well-written drama. Strangely, these strong elements never come together to deliver the impact that leaves the film spinning in your mind. When I walked out of The Ides of March, I felt it was good, but that the movie contradicted itself. How could Steven criticize the American people’s obsession with personality rather than policy when he’s just as enamored of Morris’ character? But when cast inside the notion of politics, and perhaps even human nature, as the art deceptive, the film gels together. Or maybe I’m just kidding myself.